You’ve started to get into cricket but you can’t quite get the hang of the fundamentals. Who’s a batsman? How many are there? What are those little wooden sticks called again? Isn’t the judge called an Emperor? Who are the fielders? Are we playing rounders? Never fear – here are the very basics because when learning something new it’s always best to start at the beginning. Soon you’ll be buying your cricket gear and heading to the pitch without worrying about offending the ‘Emperor’ in the white coat. First of all you need to know the players. Batsman – this is the player who will attempt to hit the ball. There are two on the pitch at the same time but only one is actually trying to hit the ball at a time. They are part of the 11-person team that is currently batting. Bowler – this is the player who throws the ball, attempting to get the batsman out. They are part of the 11-person team that is currently fielding. Wicket-Keeper – this is the player who stands directly behind the wicket and is allowed to wear protective cricket gear such as gloves and external leg guards. This player attempts to intercept the balls that pass the batsman. They are on the fielding team. Fielder – Any of the nine remaining players on the fielding team who take up numerous positions on the pitch in an attempt to catch or field the ball and stop the batsman from achieving a run. Umpire – Essentially the judge of the game and of which there are normally two; the umpire enforces the rules and keeps track of the match. Ball – Does this need explaining? It’s hard, solid, made of leather and usually red or white. Bat – Usually made from willow, the bat has a flat front and a curved back, is a maximum length of 38 inches and has a cane handle. 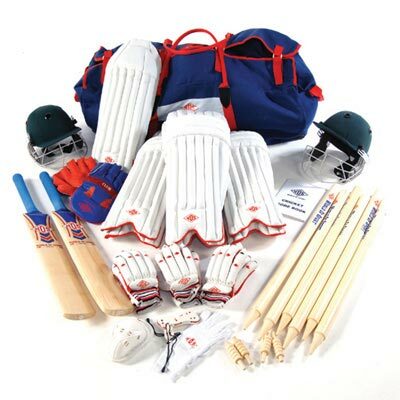 Uniform – Cricket kit is what makes cricket such an eye-catching sport. Dressed in white, cricketers wear a shirt, trousers, a cricket jumper and cricket shoes. The batsman and the wicket-keeper wear protective clothing such as gloves and helmets. Wicket – Three vertical wooden stumps in line with each other in front of which the batsman stands. Two wooden sticks, known as the bails, rest on top of the stumps to complete the wicket. Pitch – A cricket pitch lies within a cricket field and has a length of 22 yards with a width of 10 feet. This is where the bowler, batsman and wicket-keeper stand and where most of the action takes place. Cricket field – Fields vary dramatically but have a limited radius of a maximum of 75 yards and are officially 61.32m². The boundaries are typically marked by fences or painted lines and within this is where the fielders position themselves. Creases – Cricket pitches have four sections called ‘creases’ which are marked by white lines and show where certain players and action must be. So there it is. Now you’ve got the fundamentals of cricket down you can purchase your cricket supplies and clothing and understand what it’s actually for. With the basics covered, you can head out for a game of cricket and after a couple of innings* you’ll have the hang of the sport. About the Author – Kitiara Pascoe blogs frequently about starting out in sport and fitness and has an ongoing interest in active and outdoor pursuits. Discover more about the cricketing world at www.3dsports.co.uk.